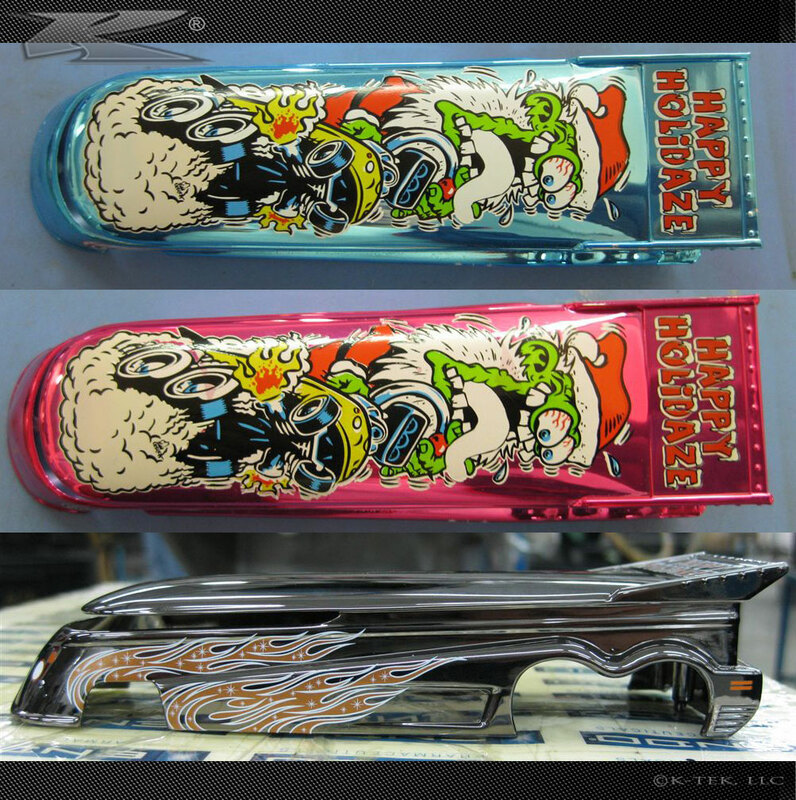 Some shots from the factory featuring all the great colors of our “Happy Holidaze” Series. 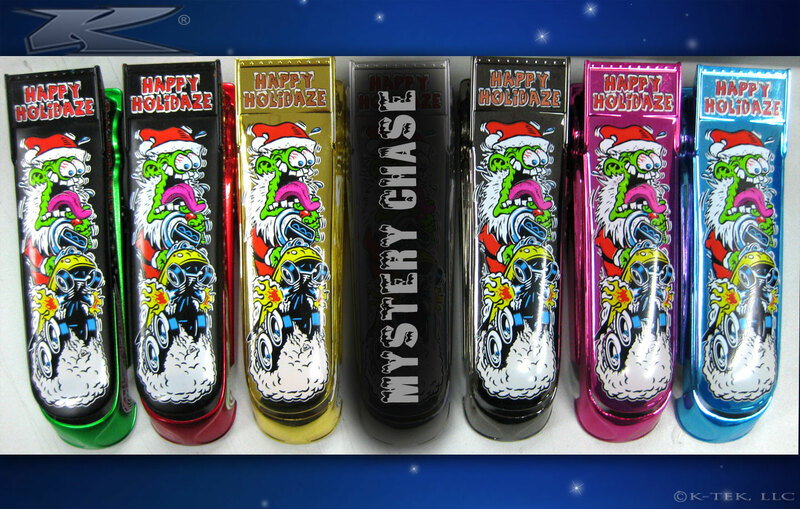 As mentioned before, all chase cars will be silver plated with liquid (kandy) paints or the 24k’s gold plated. Silver plating brings the ultimate shine! Then there is the Black Gold edition, which features a different black chrome process. The colors are brilliant! We should have our official photo’s up soon and more photos added to this post. Looking forwad to another great creation from Dave.. Yet another amazing design, and bus from KustomCity. These look awesome, I can’t even pick a fave color, as they are all fantastic, I can’t wait to order my 2 sets. lol, how time flies, it’ll be here before you know it. That black gold one is my fave………….I think, LOL, but they are ALL fantastic. I can’t wait to see the mystery. These will be my Christmas present to myself. I’m gonna have to do some wheelin and dealin and sell a few things so I can get this set. Had to pass on the last two but I want in on this fer sure. I have to say at first it was a pink-magenta, but from the looks of it, it’s like HOT PINK! Again you and your team are to be congratulated for this new set. Olá Mario tb sou do Brasil ( São Paulo ) e gostaria de comprar uma EVO dessas , vc sabe se eles entregam aqui e quanto fica as EVO . Hey Mario, hoping to make it to Brazil next year! Am a big Roth-Rat Fink fan, so love the artwork. As I’m sure others have said so another great looking series. Thanks for the sneak peek. Now when will we see a woody edtion like the artwork on the website? Happy Holidays to all! Hi Everett, was great working with John D. on his finkish character. I really loved the artwork he did on the roof. We should have sneak peeks up soon of our new casting for 2011 and it’s that “woody” everyone ask about, should debut mid to late ’11. congratulations, wonderful view, comes to my collection. I think the red and the green one would look cool with color matched tires ?? ?, just a thought. HAVING SURGERY THE 1ST,PRAYING I CAN GET HOME IN TIME TO TRY FOR THESE,HAVE EVERY OTHER ISSUE BY DAVE TO DATE. Hope it goes well coach! These Chrome Colors are Super Fantastic and I have to have these for my collection. That Black Gold is Wicked. Can’t wait to see what the Mystery looks like. Great job on the X-mas theme. Thanks Joel. you can never go wrong with ‘chrome’ deco’s. I think my the 2 that stands out for me is the ‘hot pink’ and ‘ice blue’. but then again…. I live in Brazil and I buy the EVO, you guys deliver here, my zip code is 04276-000, São Paulo. yes Mario, all you have to do is go to our site and order. We have many customers from Brazil. Just saw the pics of the mystery tires, and the factory shots of the pink and blue buses, WOW that finish is awesome, and a really nice touch with the tires. I week today, WHOO HOO……. THE WOODY, alright………I’m picturing a dark forest green and a dark royal blue over chrome, I love that finish, LOL. I think all look soooooo beautiful, keep up the good work. Please change the body style to the “Nitro Bomb” Don’t you think a totally new style is pass due? There are many factors involved and it’s not as simple as you may think – one is $$$ among them, besides we had a new tooling with the Big Tow and will have a new casting in 2011. 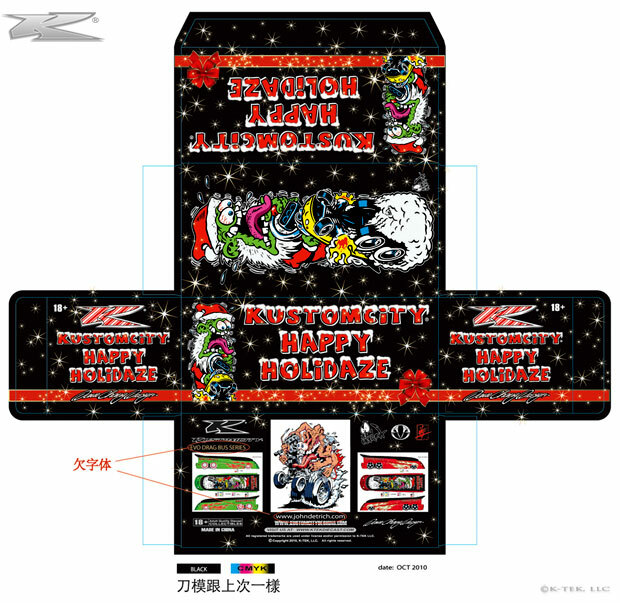 The GT Drag Bus is a favorite and best candidate for artwork, and that’s what I’m about more so, which is the artwork and deco’s that goes on them. Thanks. Dave – another excellent product! Looking forward to that chrome shine. Hopefully I’ll get lucky and get a black-chrome! The Mystery versions have been really nice – some of my favorites. Glad to hear hints of a Woody next year! Got to cut back on starbucks so I have enough to afford these little treasures. Hope you and your family had a great Thanksgiving! lol, thanks. My Doc said to cut back on my caffeine, no prob- but I’m a fan of american Pepsi. Dave You & The Gang Have Really Got it going on . 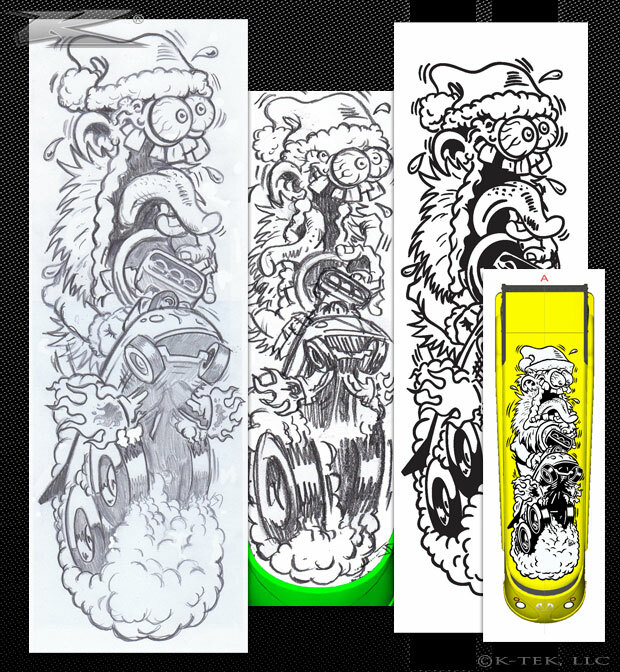 That Rat Fink art work is just to die for I am A big fan of Rat Fink so that makes all the Greater; That Chrome Color Sheme Esp. The Blue ,Pink Cant wait for that sweet christmas Gift to myself LOL ! Keep up the great work dave. Love your style of dicast I think it’s one of the best out there!!! Thanks James! We always give it our best. lol, it is like opening gifts! we got the samples in today and it’s not even gift wrap! Hi Again Dave. You mentioned a new Casting in 2011, Does that mean your done with the Big Tow Casting? I hope not, I think they have more Potential. What say you Bud? P.S. Seasons Greetings From Canada!! Not at all Joel. The Big Tow will come out again but first we have other things coming up that are equally cool. I think the Big Tow is such a cool design and proud how our team put it together. lol. Ted, I’m looking at them my first time right now! all I can say is WOW! Most of the time I’m there at the factory approving changes on the spot, saves time. But to see this in hand for the first time is really something. When I look closer, that silver one, is actually the black gold, regardless, it’s still my fave. Dave I’m really impressed with what you’ve done with this release. The red/green set is oh-so-perfect for the holiday season. As for the pink/blue set…oh my…it is simply exquisite! Hey dave : Im writing to see if you guys are already out of stock because iv been waiting here at the site waiting for the sale to come avalible and I still have nt seen it pop up as of yet the time here in southcarolina is 10:35 am. Thanks For your time dave! You would think that I had no Schooling. I forgot About the time Defference frm you guys and here DAAAAA LOL .Just ignore That last Message slash Comment .. It Looks Like I will Buy The Big Tow as well Because I never ordered That one . But Like I was saying before That Pink one Is Truly One of the hotest diecast Pieses I have ever seen!!!!! Due to circumstances, I have stopped collecting die cast. I saw this and told Santa that I’ve been extra good this year, and that the Rat Fink artwork on this bus blew me away. I couldn’t pass it up! Very Kool!! !